If you’re an Indian citizen then you must be aware of Aadhaar card, a unique 12-digit identification number issued by the Government of India through Unique Identification Authority of India (UIDAI). The Aadhaar issued to all Indian residents is based on their biometric and demographic information, thereby serving as a valid proof of identity and proof of address. As you might be aware, the Government of India has made it mandatory to link Aadhaar with your mobile number, PAN and bank accounts before 31st March 2018, in order to continue the services and avail benefit of many government schemes. Perhaps, if you’re a Bank of Baroda account holder then you should link your bank account with Aadhaar card now. While there are several ways to do so such as offline by visiting the bank branch, online using net banking (requires a user ID and password), and through SMS. Personally, I tried both the online and SMS method to link my BOB account with Aadhaar but both these methods failed for me. Today, I’ll be stating the easiest way to link Aadhaar with Bank of Baroda online using OTP based verification and without requiring your Net banking details. This is an official method and seems to be introduced by the bank recently. Before proceeding, keep your Aadhaar card number and bank account number handy. Also, make sure your mobile number is registered both with your bank account and Aadhaar to receive OTP. 2. 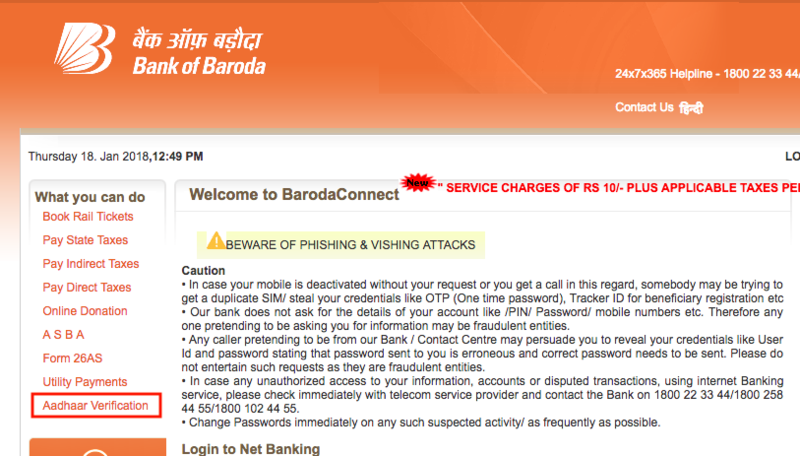 In KYC Verification page, carefully enter your 14-digit Bank of Baroda account number and mobile number. 3. Then click on “Generate OTP” tab. Enter the OTP received from the bank and click confirm. 4. A new webpage will open. 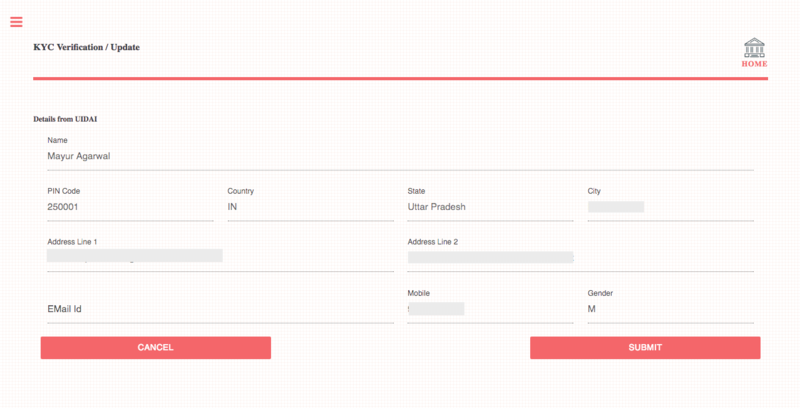 Select your customer ID from the drop-down menu and enter your Aadhaar number. Note: On the same page, you need to choose the purpose for Aadhaar seeding/authentication. 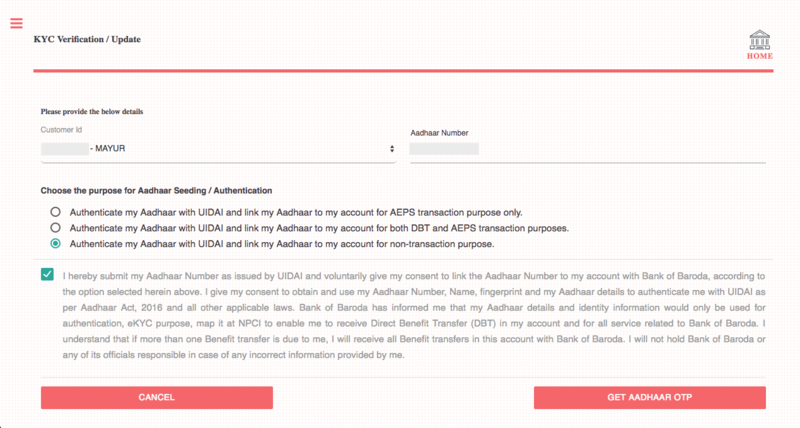 You can select either between Authenticate my Aadhaar with UIDAI and link my Aadhaar to my account for AEPS transaction purpose or for both DBT and AEBS transaction or for non-transaction purpose. For those unaware, AEPS refers to Aadhaar Enabled Payment System while DBT refers to Direct Benefits Transfer. 5. Click the confirmation checkbox and click on “Get Aadhaar OTP” tab. After entering the OTP received from Aadhaar, you’ll be shown your details from UIDAI. 6. Click on the Submit tab. The page will now state that “Your request for Aadhaar linking/authentication has been submitted successfully…”. That’s it! It should be noted that the verification process may take a few days.